After Turkish president Recep Tayyip Erdoğan, Aleksandar Vučić is the foreign politician Prime Minister Edi Rama seems closest to. In the past five years, Rama and Vučić have met during one-on-one and joint meetings upwards of 10 times, including an official visit Vučić made to Tirana, and 3 of Rama’s to Belgrade. However, beyond superficial propaganda, the Rama-Vučić friendship has had little rewards. Trade and economic relations between Albania and Serbia remain unchanged, whereas there have been no other developments or collaborations in other areas. Rama has used this friendship as a personal bragging point, positioning himself as an important Balkans leader and a contributor to peace and cooperation in the Balkans and beyond. However, the true beneficiary of this friendship has been Aleksandar Vučić, who has skillfully used Rama to strengthen Serbia’s position in its negotiations with Kosova. One of Serbia’s main approaches in these talks has been the claim that Serbians are open-minded and prepared to compromise, and it is Kosovars who are irresponsible and irrational people with whom one cannot negotiate – therefore a strong imposing hand is necessary when dealing with them. 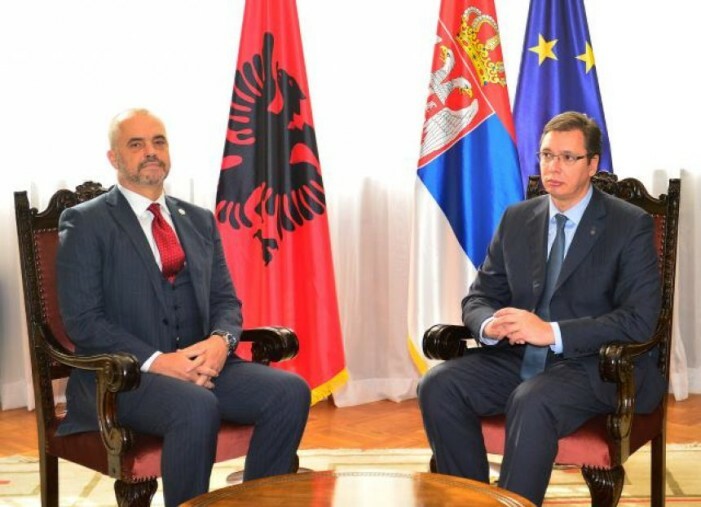 It is exactly this thesis that the Rama–Vučić friendship has helped push via propaganda: Serbians can now easily claim that they have nothing against Albanians, on the contrary they are open to collaborating and befriending them – as demonstrated by the Rama–Vučić relationship and the excellent relations between Serbia and Albania that the two leaders have established. Therefore, Serbians cannot possibly be accused of prejudice, racism, or ethnic hatred against Albanians. It is the Kosovar leaders that are irresponsible, unlike the “good” Albanians represented by Rama. She asked the international community to understand the “endless patience” it takes to negotiate with Kosovars, as they are “unprincipled, irresponsible, and unpredictable.” Brnabić accused Kosovars of having done nothing to respect the agreements they have reached in Brussels in the last five years. She also accused Kosovars of having violated international regulations regarding official visits in foreign countries, referring to the fact that the Kosovar authorities did not allow Vučić to organize certain meetings during his predicted visit to Kosova in a few days. Additionally, she accused Kosovars of having harassed the Serbian negotiation team, referring to the arrest of Marko Djurić by Kosovar authorities. To reinforce theses accusations, Brnabić claimed that Vučić has worked to establish good relations between Albanians and Serbians more than any other politician on any side for the past 100 years. To illustrate this claim, she pointed precisely to the president’s relationship with Edi Rama. Brnabić praised Vučić for inviting Rama to Serbia, as the “first Albanian Prime Minister to visit Serbia in 68 years,” as well as for organizing another of Rama’s visits during which an economic forum was held in Niš. The message here is clear, Vučić and Serbians work well with Albanians, as their collaboration with Rama proves. It is the Kosovars who are unprincipled and irresponsible, hence, another (more forceful) approach is merited with them. Thus, the international community mustn’t give Kosovars an inch in their negotiations with Serbia.